Agricultural technology continues to advance at a rapid pace. Farmers and ranchers can inspect aisles and aisles of the latest products and services to help boost the performance of their operations at the 2019 Western Farm Show to be held Friday through Sunday, February 22-24, at the American Royal Complex in Kansas City, Missouri. 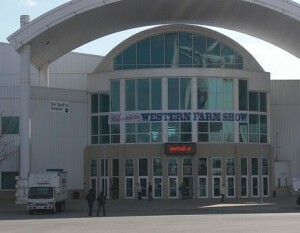 Now in its 58th season, the Western Farm Show features one of the region’s largest indoor displays of farm and ranch products. With 500 exhibitors and 400,000 square feet of exhibit space, all under one roof, attendees will find expansive displays of new equipment, farm structures, fertilizer, feed, seed, tools and much more! The Western Farm Show is produced by the Western Equipment Dealers Association, which represents regional agricultural equipment dealers. Show hours are 9 a.m. to 5 p.m. Friday and Saturday, Feb. 22-23; and 9 a.m. to 4 p.m. on Sunday, Feb. 24. Adult tickets are $10 daily. Children ages 12 and under are free. A $3 off coupon is available by filling out a survey on the show’s website or visiting a participating dealer member of the Western Equipment Dealers Association.